Prior Phillip of Kingsbridge has a glorious vision. To build the largest, most beautiful cathedral in England. To accomplish the task, Phillip recruits the most renowned builders in the country. However, the fate of the Cathedral is constantly threatened by all manner of catastrophes and oppositions. 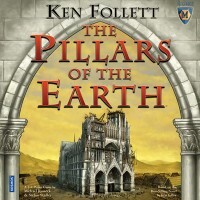 The Pillars of the Earth is based on Ken Follett's best-selling novel. Players join together to help build Kingsbridge Cathedral. Using your workmen and resources, you must wisely deploy assets to overcome unexpected difficulties and shortages to prove yourself the greatest builder of them all! Will your efforts be recognized when the Great Cathedral at Kingsbridge is complete? Jeremy's notes: A very well designed Euro-Style worker placement game. Although I can appreciate the simple complexities of the strategies within the mechanics, I feel that the lack of a unifying theme and over extended length of gameplay make this game harder to enjoy then they should. This game is easily both a fantastic intro game to worker-placement, and also sits atop a pillar of the earth to veteran gamers alike. The rulebook is very well laid out. It’s laid out in such a way that it tells you how to set up, then allows you to read a paragraph, play the first round, read the next paragraph, play the second round, and so on. As this is the case (also, nothing is secret from other players – everyone can see everything belonging to everyone else) this also makes it so easy to teach. 1. Tax. Everyone round, everyone must pay tax, unless they place one of their 3 workers in a particular spot on the board during the worker-placement phase (therefore, this is totally avoidable). 2. Workers being drawn from the bag. Each player has 3 workers which are all put in a bag, and turn order is decided based on the order of which each worker is pulled from the bag. You may think this would be a game-breaker with regard to luck, but it is not. If you’re drawn first, you could choose to take your turn first or wait until other people have had their turns. If you choose to go first, you must pay up to 7 gold. If you choose to go last, you will pay decreasing amounts based on turn order, and potentially pay 0 gold. Therefore, there are advantages of both waiting, and going first (going first would give you prime pickings of the available spots on the board). Phase 2; Master Builders: This is the point where your workers are drawn from the bag and you can choose what you want to do with your round, placing your workers on particular spots on the board. Phase 3; Resolution: Resolve the board as clearly numbered in order. Before moving onto the next round, you can cash in some resources for VP. After doing so, you start the process again. There are a total of 6 rounds per game. The game can play 2-4 players, though it does play a little slow and it does have a few flaws when played with only 2. However, with 3-4, this game is simply immaculate. The only improvement they could have made with this game, is improving the way 2-player works. Everything else about this game really does make this game such an amazing worker-placement game which other games can aspire to. If you’re looking for a 3-4 player worker-placement game, try and get a hold of a copy of this game, you won’t regret it. If you only want a 2 player game or you need more than 4, then you may want to look elsewhere. There is an expansion which allows up to 6 players, but it’s really not easy to find! Pillars of the Earth is a tabletop game based on a novel by Ken Follett. It’s a wonderful historical novel set around the construction of a cathedral in 12th century England. Knowing that information might make you wonder how a game could possibly be based on this book. However, the game not only stays true to the novel, incorporating major characters, but it uses the building of the cathedral as the basis for the rounds of the game. However, one doesn’t have to have read the novel in order to play and thoroughly enjoy the game. The game has nice graphics, durable wooden playing pieces, and decorative yet historically accurate character depictions on its cards. It takes a while to learn to play, but once you have learned the rounds progress rather quickly toward the game’s conclusion. Beginners can play alongside more advanced players, and the game is actually easier to learn by playing with gamers who know how to play. I recommend the game for gamers interested in history and in games emphasizing building strategies. Add a Review for "The Pillars of the Earth"